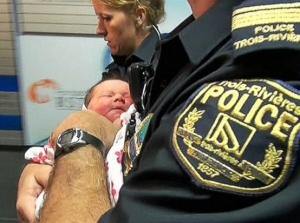 Does this stolen baby prove the advantage of social media? Just before 7pm Monday night, May 26th 2014, a woman in red nurses scrubs walked into the Quebec hospital room of Mélissa McMahon. She asked for McMahon’s newborn infant saying the baby needed to be weighed. Just like that, her baby was gone. What happened next is being portrayed as a striking example of how social media is gaining an upper hand over traditional media. But, is it? Realizing the baby was gone, hospital officials turned to the media and issued an Amber Alert. Within minutes, road blocks where erected and a full-scale police search began. Lucky for the baby, though, the news was also posted on Facebook. 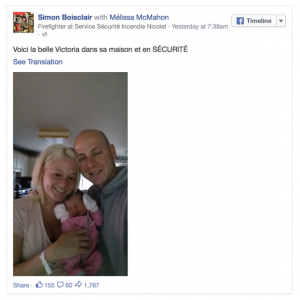 “Help us please, after one day, our daughter has been stolen,” read the Facebook post from Simon Boisclair, the baby’s father. Reading the description of the abductor, Charlene Plante realized the kidnapper was her neighbor. Police were called. The baby recovered. Mother and child reunited. Total elapsed time: under three hours. It wasn’t the TV reports, or radio bulletins that brought the baby back. Tragedy was averted by a personal message sent by one person, seen by another. 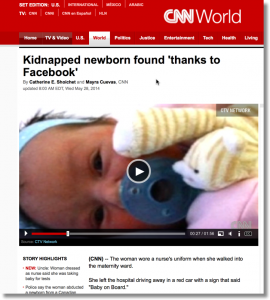 Whether intended or not, he crowdsourced the baby’s rescue. Contrary to the media ballyhoo, however, this isn’t a victory for social media. It’s more accurately proves the power of a compelling message. Our baby has been stolen. Gets your attention, doesn’t it? He didn’t muddy it up with needless detail or unsubstantiated claims. He didn’t talk about what great parents they may be. Or, their hopes for the girl’s future. He cut to the chase because that’s how people communicate. The saliency of his message did the heavy lifting. Help. Daughter. Stolen. It’s impossible to imagine tighter message focus. Consider this a template. Is your message compelling? Does it state a relevant case concisely? Is the call to action clear? I’m also betting he didn’t analyze which media would target the “right people.” His message did the targeting. Facebook may get credit for delivering it. But, the baby-saving credit belongs to the message alone. Mother and child are together as you read this because dad didn’t try to move an entire city. His message got results by speaking to one person, clearly. wow. The strenght of Facebook is unbelievable. Thank God they can find their baby.